Participants in Radio Rootz DC, a "media literacy and production program for youth," interviewed members of the Ward 1 community in Washington, DC. 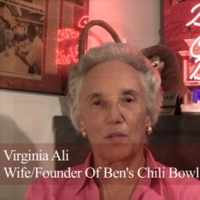 Ali founded Ben's Chili Bowl with her husband in 1958. In this interview, she discusses her family life, the business, and the history of the U Street corridor. The Humanities Council holds the right to display and distribute grant funded materials. Researchers are responsible for obtaining proper rights and permissions from original copyright holders. Radio Rootz DC and People's Production House, “Superheros of Ward 1: Virginia Ali,” DC Digital Museum, accessed April 22, 2019, https://wdchumanities.org/dcdm/items/show/1683.